Mosel: Biking along the Mosel, waving to camping tourists, picnicing among the vines or under a tree, stopping at a Weinstube or in a quaint village… Makes you feel a bit like this. Mosel: Weingut Markus Molitor, Bernkastel-Wehlen / Zeltingen-Rachtig. For excellent winetasting in a pleasant environment with wonderful view of the steep slate vineyards along the Mosel. Markus Molitor’s wine is highly praised internationally – try the Wehlener Sonnenuhr, can’t go wrong. The kids will get home-made grape juice, and they can go on the swing or climb the tree in the garden (Rachtig). A meal can be ordered in advance. 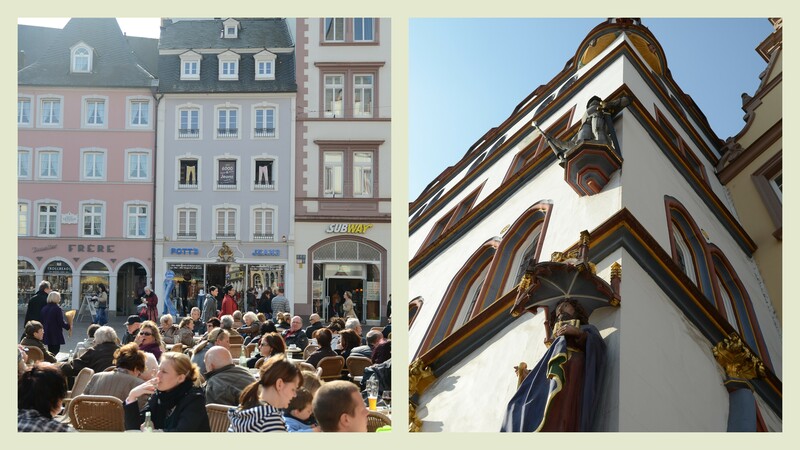 Trier – there’s just more of an atmosphere than in Luxembourg, more vibrant. Go early to avoid traffic and have breakfast at Zur Steipe, outside on the Hansel & Gretel town square if it’s warm enough. If one of the humongous cakes is too much, then at least take a look at them. Afterwards, take the tiny road past the toy museum and visit Point for some shopping, or have your hair done, or have a cake – there’s a cute cafe which frequently exhibits local art. Trier: Genussgesellschaft. Totally NYC style bookstore and French restaurant/cafe in one of the most beautiful Jugendstyle buildings in Trier. Books handled with love & coffe and cheese cake made with love. A feelgood tip from Kristina. Trier: Terra Viva. A cosy shop with jewelry and bags, etno and wood, caligraphy and books, blankets and cushions – and other accessories. A feelgood tip from Ann-Kristin. For more tips in Trier, take a look here.